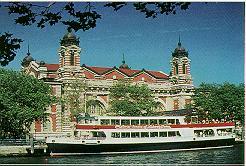 Jersey City History - Old Bergen - Chapter XLVIII. THE WARS OF 1812 AND 1861, AND OLD LANDMARKS. AFTER a period of peace, there were again rumors of trouble with Great Britain, and her insistance on the "Right of Search" made another outbreak probable. The bitterness engendered during the Revolution was revived, and once more the territory of Bergen was aroused by the bugle call and the martial tread of armed hosts. War was declared, and active measures were adopted for the defence of New York City, which was supposed to be the objective point of the enemy. New York State being threatened at her northern border, and most of her troops being employed in that direction, she was obliged to rely on New Jersey for the protection of her chief city. August 13, 1814, Gov. Pennington of New Jersey issued his proclamation for the enrollment of men, and ordered a force, composed of different companies of the state, to march immediately to Paulus Hook, where Brig. Gen. Colfax was to assume command. Some of these troops were encamped at and surrounding the "Old Arsenal," that stood on the north side of Summit Avenue, about midway between Newark and Hoboken Avenues. Gen. Swift reported to Gov. Tompkins of New York, that the Jersey troops were enrolled and occupied a fortified camp at Bergen Heights. They consisted of twenty-three companies, and as soon as inspected, were formed into regiments, under command of Col. J. W. Frelinghuysen. Some were stationed at Paulus Hook, and some at Sandy Hook, while those remaining encamped at Jersey City Heights were kept in readiness, in case of any attempted entrance into the Bay or attack upon New York. They were never called upon for active service, however, as during that campaign, active hostilities were carried on upon the Canadian border and in the neighborhood of Washington. The treaty of peace was signed December 14, 1814, but before that date, it was apparent that the end of hostilities was drawing near, and the need of a defensive corps removed. On December 1, 1814, this brigade of Ne%v Jersey militia was paid by the Corporation of the City of New York, and discharged from the service of protecting that city. Col. Frelinghuysen wrote to Gov. Tompkins December g, 1814, expressing great satisfaction at the treatment of his troops by New York, and stated they would be in readiness at all times to act in her defence. On returning to their places of rendezvous, the war being ended, the militia were mustered out; and the war clouds having disappeared, the people again settled down to their avocations. But once more, in the days of '61, the fires of patriotism blazed brightly, as the boom of the gun fired on Sumter proclaimed the beginning of an unnatural strife. It is hard at this distance of time and under prevailing conditions, to thoroughly appreciate the intensity of feeling that prevailed during those troublous days. No foreign foe threatened our shores, but internal dissensions clouded the future with doubt and uncertainty;	ties of blood and interest were rudely torn asunder, and neighbor looked askance at neighbor, while men spoke with bated breath. There were white faces and troubled hearts, but the patriotic citizens of "Old Bergen" showed no signs of faltering, and when the call for troops was made, they were among the first to volunteer for the defence of the national capital. April 15th, 1861, Simon Cameron, then Secretary of War of the United States, wired Governor Olden of New Jersey that he had just sent a despatch, callinn on him for four regiments of troops for immediate service. The governor, without waiting for the receipt of the official paper, which by the way was not received until the 17th, at once communicated Nvith all sections of the state. On the following day, April 16th, a meeting was held in the City Hall, Jersey City, for the purpose of aiding in the enlistment of troops; and volunteers being called for, immediate response was made. On the Sunday following, patriotic sermons were preached in all the churches, which raised the feelings of the people to a white heat. The figure of old Dr. Taylor is vividly recalled, as with quivering lip and streaming eyes, he implored that the red hand of war might still be stayed, but pointed out in most emphatic terms the great danger of apathy and the necessity of instant preparation, so that the purpose of those who would pull down the whole fabric of our government might be thwarted. At his invitation, Company A of the 2nd Regiment, Capt. Garret D. Van Reypen, largely recruited from within the confines of "Old Bergen," marched to the church on the following day, to receive at his hands a testament for each member, together with his blessing and God-speed. On the 22nd, a committee of five citizens was appointed to provide for the equipment and transportation of the regiment, which duty was so promptly performed that on the 26th, only four days after, and ten days from the first notification, the 2nd New Jersey Regiment was encamped at Trenton, prepared to enter upon an active campaign. This was the more notable, as the North was at the time completely unprepared for war. The necessary expense attending the sudden call for troops was borne by individuals, who were afterward reimbursed through the issue of local bonds. This War Committee was continued throughout the war, and took under their special charge the families of those who were thus suddenly called away. Large amounts of money were subscribed, by means of which, under its judicious management, the general government was relieved of much embarrassment. The thrilling accounts of these troublous years may be found in detail in our state records, and the names of those honored heroes emblazoned upon her escutcheon. In the old days the ridge of high ground extended in an unbroken front, save for the indentations of natural ravines or watercourses, from Greenville north ward, until it merged into the grand old Palisades, the wonder and admiration of the world. Following from its commencement an almost direct line to about the present line of Academy Street, it there jutted out in a bold promontory, from eighty to one hundred feet high, called " Point of Rocks," where the Pennsylvania Railroad round-house now stands, and then receding, followed about the original line northward. The stream of water known as Mill Creek, flowed in from the Bay just north of the high point of land, now levelled, near the present junction of Jersey Avenue and Phillip Street, and in a curving line through the marsh until it reached the Point of Rocks; thence it followed the base of the hill northward to near Hoboken Avenue, where it mingled its waters with a stream that flowed into Harsimus Cove. This creek was of considerable importance both for commercial reasons, and as a means of communication with Bergen Town. The farmers loaded periaguas at Newark Avenue (where the West Shore freight house now stands) with garden truck for the New York market; and in the early spring, when escaping frost rendered the road from Communipaw well nigh impassable, the devout worshippers at that place, loath to lose the privileges of the sanctuary, took boat to Point of Rocks, and there clambered over the rocks at Academy Street, or followed the steep ascent of Mill Road, and thence through the lane opening on Bergen Avenue at Foye Place, to the church. With the exception of a few farm clearings, until a comparatively recent day the whole of the northerly part of the township was covered with dense woods, which likewise continued in an almost unbroken line along the western slope all the way to Bergen Point. There were also extensive groves at intervals along the eastern brow of the hill, notably at Weehawken and North Hudson. As has been mentioned, one of the great attractions of " Old Bergen" was its sparkling spring water. The purity of this water was greatly appreciated, and numberless wells were sunk throughout the territory. They were walled up with stone, and during the early days, like the old well in the Square, were surmounted by a well-sweep with bucket. So cool were they that they were utilized during the hot months for the preservation of butter and meats, which were lowered to within a few inches from the surface of the water, and there kept suspended until needed for use. 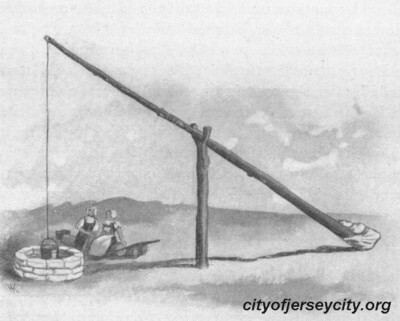 In 185O the population, especially of lower Jersey City, had increased to such an extent, that the water supply from the old wells not only became inadequate, but many of them were abandoned on sanitary grounds, and covered over. During this time, drinking water from the wells on the Heights was carted around and sold by the pailful. Public attention was thus directed to the necessity of procuring anew and full supply. In 1851 a water company was incorporated, and about three years afterward, the water service and reservoirs were completed. The source of supply was the upper part of the Passaic River, which at that time afforded a generous supply of good potable water. June 30th, 1854, the reservoirs were filled and the water let into the distributing pipes. An event of such great importance was marked by a special celebration, in which the whole community joined. A procession was formed of leading citizens, escorted by fire and military companies, many of these from neighboring cities, which wended its way from lower Jersey City, though the principal streets, and to and around the reservoir at Central Avenue on the Heights. The long line of blue and red shirted firemen, drawing their well polished and gaily decked machines and encircling the reservoir, was indeed an inspiriting sight. The rejoicings were general, and the day was concluded with banquets and congratulations. Some of the old wells, however, continued in use to within very recent years. Many a thirsty wayfarer has had reason to bless the old Academy Street well that was located for centuries on the north side of that street about midway between Tuers and Summit Avenues. And even at the present day, pilgrimages are made by many to the old well still in use on the Van Riper homestead, corner of Academy and Van Reypen Streets, from which has continued to flow the clear, refreshing water since the very foundation of the town. In the early days conflagrations were infrequent, and when they did occur they brought out all in the vicinity, with pails, pans or any vessel suitable for holding water. These were passed from hand to hand by establishing long lines, from the nearest wells or cisterns to the fire. As buildings became more dense, some new method was demanded and volunteer companies were formed. These were maintained at first by subscription-but afterward became a city charge, with no pay attached for service. Those were palmy days, and the rivalry between the different companies resulted in prompt and efficient service. No old fireman can recall without a thrill, the being roused at midnight by the clang of the fire-bell, and almost unconsciously donning the clothing	which was always conveniently placed, and then rushing, plunging, jumping, rolling down the stairs, and landing in some mysterious way, yet scarcely awake, in the fire boots that stood at the foot. Then intent on gaining the post of honor (the tiller) in advance of any other, he would speed to the engine house and strain every nerve to move the machine toward the scene of conflagration. The excitement would grow apace, as the different companies struggled in their endeavor to "get on first water," and the hoarse shouts of the firemen and the clanging of the engine pumps excited an enthusiasm that seems to linger through all the passing years. There are still standing some of the old dwellings, erected far back in colonial times, which bear evidence of the substantial manner in which the houses of those days were built. The Demotte and Zabriskie mansions at North Bergen, the Van Horne homestead at Communipaw, the Gautier home at Greenville and the Vreeland house at Cavan Point are instances; and could the walls of these venerable structures speak, many tales of the privations and sufferings of the early settlers, as well as much secret history of the Revolution, would be rescued from the oblivion into which they have fallen. The Gautier home was originally built by one Tom Brown in 1760, who was a privateer, and in 1747 married a Van Buskirk, who had inherited a large tract of land, on a part of which the building stood, it being contained in the patent confirmed by Governor Carteret in 1667 to Lawrence Adriense. This Captain Brown was the person who established and maintained a ferry across the Hackensack, known as Brown's Ferry, which after 1715, when the road to Newark was laid out, was one of the connecting links in the stage route from New York to Philadelphia. He was a sturdy patriot, and espoused the cause of Independence with great vigor. Tradition states that in his early days he became very familiar with the coast of Africa, and frequently ran into the harbor a cargo of slaves, some of whom were confined in the cellar of the house, while he was negotiating their sale. The old home was likewise the scene of many gatherings, attracted thither by the well-known lavish hospitality of its owner; and its spacious banqueting hall and roomy parlors entertained many of the notables of the day in feasting and revelling, such as was peculiar to the early times. During the Revolution it became the rendezvous for patriot officers and sympathizers, whose drooping spirits were often inspired through the genial hospitality so bountifully dispensed within its walls. The Vreeland homestead was another ancient building that stood a few hundred feet north of the one just mentioned, being located like it on the shore of the Bay. It was a conspicuous object to all sailing up the harbor, and its prominence subjected it to rather rough usage. During the early colonial days and the Revolutionary War the old house sustained many attacks from the Indians, and many a bullet hole in the old oaken wood-work testified to the fierceness of attack and defence. During the Revolution, an English war ship opened fire upon the house, and in after years a cannon ball, imbedded in its wall, was shown as proof of the danger to which its inmates were subjected. In this, as well as in its neighbor before spoken of, many a merry dance was held and countless guests royally entertained by the old Dutch settlers. The absorption of the valuable waterfront of Communipaw by our large railroad corporations, and the consequent filling in and docking out, have forced the "old settlers" away, and one by one they have departed, some to that other country where rest and peace continuously prevail, while the later generations have moved to more pleasant surroundings, until at the present writing but one remains (Mr. Garret Bush), who, amid the changes and encroachments, still clings to the home of his fathers. The charm that lingered so long over the old settlement has gone, and the ancient roof-trees have been demolished or so changed that the spirit of " Long Ago " has fled, never to return. The following newspaper clipping of 1873 is of interest as showing how, even to that late date, the old hamlet slept in pristine quietude. The ancient hamlet of Communipau, lying on the New Jersey shore within sight of New York, is a precious relic of the days long gone. Two centuries and a half have hallowed its fields and homes as the dwelling places of men. Only a cannon-shot distance from the Battery, it sleeps across the Bay in its ancient Dutch repose, only a half hour from the marble and gilt of the new, to the moss-grown homesteads of the old; only a half hour from the dash and rattle of Broadway to the whispering of the thousand shells that yet line the quiet beach of old Pavonia. There is a tradition that one day in early spring there appeared two strangers upon the shore of Communipaw, who, seeking out the "oldest inhabitants," strove to gather such traditions and reminiscences as they were able. The one was very talkative and entertaining, while the other wandered about at will and gathered up much of the material which, woven into the delightful fabric with which Diedrich Knickerbocker has enveloped the early history of our Dutch ancestors, has endowed it with such resistless charm and attractiveness. Intending to visit Communipau, our landlady told us of another good woman who lived at that place named Fitje, and recommended us to visit her, which we did as soon as we landed. We found her a little pious after the manner of the country, and you could discover that there was something of the Lord in her, but very much covered up and defiled. We dined there and spoke to her of what we deemed necessary for her condition. She has many grand children, all of whom are not unjust. We continued our journey along a fine, broad wagon-road to the other village called Bergen, a good half hour or threequarters inland from there.